Ever heard of kooda aasan or kachra aasan or badbu aasan or sadan aasan? 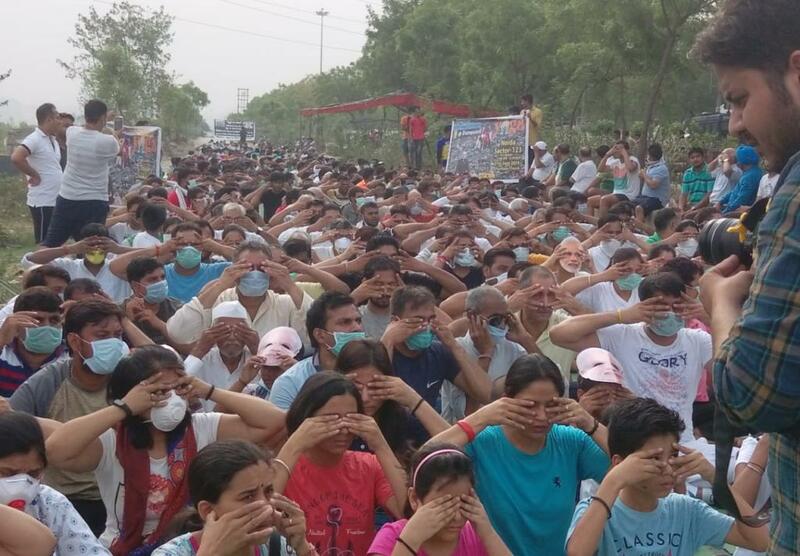 These were some yoga exercises the residents of Noida sector 123 practiced on International Day of Yoga as part of ongoing protest against the dumping site. They wanted to highlight the fact that while, on one hand, the government is promoting yoga, on the other hand, it is dumping waste near people’s homes and risking their lives. “We wanted to highlight the double standards of the Modi government and that is why we went to protest near the dump site. They tell us do yoga and stay fit and then dump garbage in the middle of the city so that our health gets affected,” says Neeraj Prakash, a resident who has been sitting in protest against the dump site since the first week of June. On Thursday, while kooda aasan was being conducted in Noida, in Lucknow, the chief minister of Uttar Pradesh, Yogi Adityanath, met senior officials of the Noida Authority and directed them to shift the dumping site out of sector 123 to another appropriate place. But this does not have the residents convinced and they are continuing their protests. Down To Earth tried contacting officials from the Noida Authority but they were not available at the time of publishing the report. The protests against the dumping site in Noida sector 123 have been going on since the beginning of June with intermittent intensification. The dumping had begun at the site after the NGT had ordered the dumping to be halted at another site in sector 54. In 2016, the residents had filed an RTI enquiry with the Noida Authority, who replied saying the solid waste management plant won’t come up in sector 123 due to environmental concerns, but it did. The residents are afraid that in the absence of appropriate infrastructure at the site it would simply become a dumping ground and lead to environmental and health issues.